BenQ today introduces two new additions to its line of digital cameras. The BenQ DC E610 and C610 are designed to appeal to a wide range of users desiring affordability, compact form factor and advanced features. 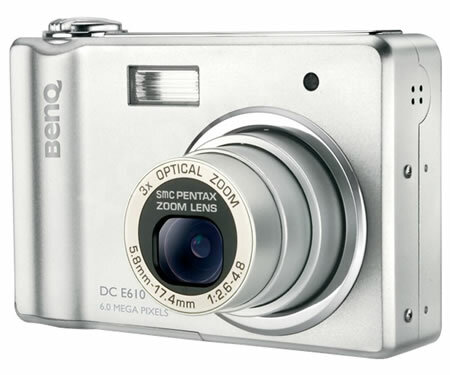 The BenQ DC E610 is a more fully featured camera with a 6.1 megapixel CCD sensor, and advanced smc PENTAX lens, 3X optical zoom, and a bright 2.4” TFT LCD screen. The top-tier PENTAX lens provides the E610 with enhanced sharpness and color presentation. It is also capable of 30 frames-per-second VGA video recording and features a shake-free option for both video and photo capture modes. In addition to its fashionable exterior with sliding front cover, the BenQ DC C610 comes with a 6.0 megapixel CCD sensor and a comfortably sized 2.0″ LTPS LCD screen for playing back photos. The C610 also uses AA batteries to ensure worry-free travel and universal replaceability. The BenQ E610 and C610 are currently available in the European market.